Only a few years ago, I couldn’t see an end to the music piracy/RIAA debacle. It would go something like this: A new music sharing application would emerge, it would be promptly used for illegal activities, and then the RIAA would roll in and hand out lawsuits which usually ended in the service being shut down (or being shut down then having their pants sued off). Now I sit here in the glorious future, and legal music services are everywhere. To make things even better: we’re giving away three 3-month subscriptions to Slacker Premium Radio! 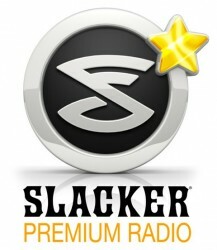 Slacker isn’t exactly new of course – the streaming radio service has built a very positive reputation since its inception in 2007. You can access the service on iPhone, iPad, Android, Palm, Windows Phone 7, BlackBerry, and many other devices. On-demand access, giving you full control over the Slacker library. If you want to hear a specific song or artist, just select it from the library and play. Play music without an internet connection: Slacker will store up to 1,000 songs on your mobile device so you’ll always have your music, even if your data connection gives out. Nobody likes a complicated giveaway, so to enter the contest simply post a comment below. Just make sure to use a valid account, whether it be email, Twitter, Facebook – we’ll need to contact you if you’re selected. Entry will close at 10:00 PM Saturday, September 3rd. Good luck! If you’ve ever read any productivity or personal development methodologies, you’ve probably been told that you should avoid checking your email first thing in the morning. It basically boils down to distraction: if you wake up and fill your head full of to-dos, you’ll be less likely to get one single thing done. Well, I’m not much of a morning person, so I love checking my email before I get up for the day. I wake up, roll over and grab my phone, and spend the first 10 minutes of my day in bed glancing (that’s not so bad, right?) at my email, then I usually check out Twitter and Google+ to see what happened in the world while I was counting sheep. I don’t feel that checking my email in the morning has negatively affected my day-to-day productivity, but you know what it has affected? My eyeballs. My room is dark in the morning and my screen emits the fury of a white dwarf, so I often find myself squinting to look at my phone. In this guide, I’ll show you how to use the Tasker app for Android to automatically manage your mobile phone’s display brightness based on time of day. First off, Tasker is a really powerful app for Android. It lets you customize almost every setting on your phone based on a huge variety of inputs, so using it to automatically dim your phone’s screen in the morning is akin to blowing up an anthill with a Scud missile. Second, because of its usefulness, the developers of Tasker put a ~$7.00 price tag on the app. This is expensive for a mobile app, but if you doubt whether it’s worth the price, take a look at a few of these great guides to see all the things you can do with it: maximize your phone’s battery, have your phone read your text messages to you while driving (and much more), and how to turn your phone into a fully-automated superphone. Step 1: Download and install Tasker from the Android Market, then open the app. 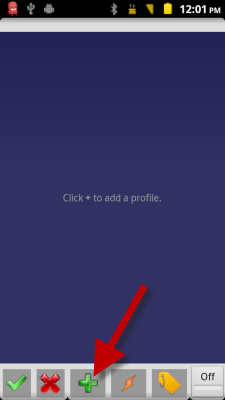 You’ll need to create a Profile first, so click the green plus (+) button to get started. You’ll be prompted to name your profile, so call it anything you want. I’ll call mine “Dim Morning Screen”. 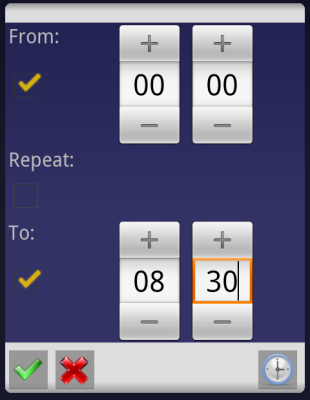 Step 2: Tasker events are triggered by Contexts, which are basically inputs like Time, Day, Location, etc. 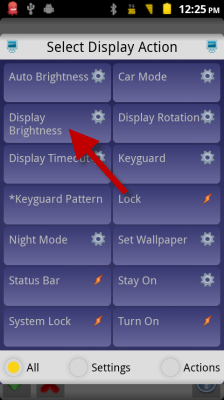 For this profile, I’m going to select Time as the trigger for changing my display’s brightness. Note: Tasker can be triggered by a multitude of inputs. If you want to create a more sophisticated profile, touch the small question mark icon (?) in the top corner of Tasker dialogs for an explanation of available features. Click the green check button once you’re finished. 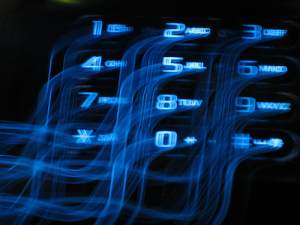 Step 4: Now we’ll create a Task which is the action that gets executed whenever your Context is triggered – dimming the phone’s display in our case. Select New Task, give it a name, i.e. 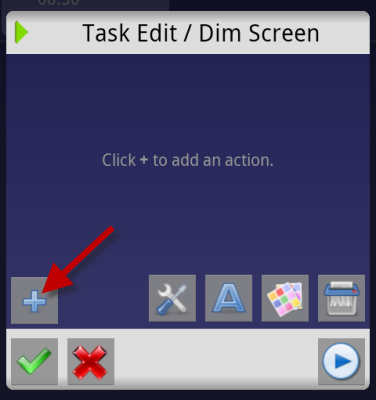 “Dim Screen”, then you’ll be taken to the Task Editor. 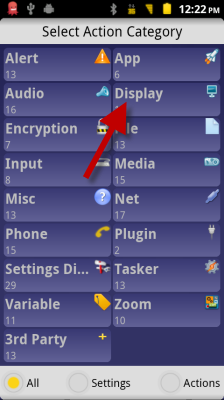 Click the blue plus (+) button to create a new task. 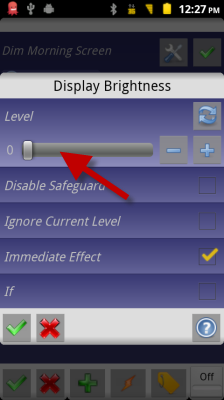 Select the Display Brightness action. 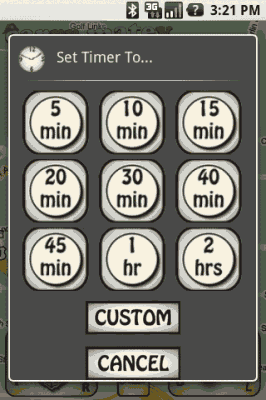 Drag the Level slider to 0 (or as low as you want the screen to be, you have a range from 0-255). 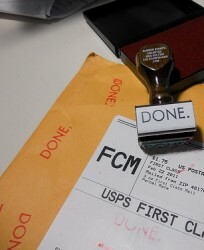 Press the green check button when you’re finished. Back in the Task Editor window, you can press the Play button in the bottom right to preview the task. Touch the green check button to save your task, then touch the Off button (it will toggle to On) in the bottom right corner of the next screen to activate Tasker. 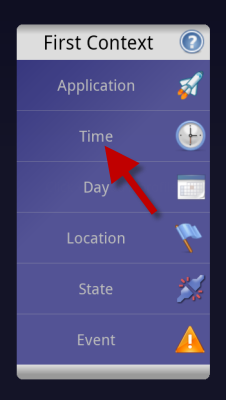 After activating Tasker, touch one last green check button to close the application. In order to work properly, Tasker needs to be running in the background of your phone’s operating system. Because of how Android automatically manages running applications, Tasker keeps an icon in your phone’s notification bar to make sure Android doesn’t inadvertently close it. You can turn the notification icon off, which I prefer to do, but keep in mind that you run the risk of having Android automatically close Tasker when your phone gets low on memory. If you’re using a newer Android phone with plenty of memory, you shouldn’t have any problems. Either way, we’ve created a non-essential Tasker profile in this guide so there’s really nothing to worry about. To turn off the notification icon, open Tasker, press the Menu button on your phone, then select Preferences. In the Monitor tab, uncheck Run in Foreground. The Tasker icon will no longer appear in your notification bar. That’s it! Your phone display will now automatically dim itself at midnight, and will stay dim until 8:30am. Now you might be asking, “But we never programmed the display to return to its normal brightness value afterwards?”. That’s one of the perks of Tasker – you original brightness settings will automatically be restored after the task finishes. Have any tips for customizing your phone with Tasker? Share them with us in the comments below! If this is your first time on the internet, here’s what you have missed: Nyan Cat is an insanely popular internet meme where an adorable half-Pop-Tart cat runs through the night sky emitting an 8-bit rainbow in its wake. Almost as memorable as the animation is the accompanying soundtrack, which I’ll give you an opportunity to listen to below. If the video isn’t enough for you (did I mention there’s a 10-hour version? ), Windows users can now add Nyan Cat to their progress bars. I previously wrote how progress bars use optical illusions to appear faster, so why not make them appear faster and deliciously entertaining? To get Nyan Cat in your progress bars, download the Nyan Cat .zip file and extract the files to your computer. Make sure to extract all of the files (not just the .exe) – they’re all needed to make this magic happen. Then all you have to do is open NyanCatProgressBar.exe and you’re set, no installation necessary! The developer notes that Nyan Cat works best with Windows 7; Windows XP users might experience animation problems. 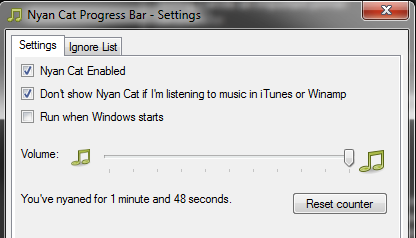 To use Nyan Cat Progress Bar, simply do anything in Windows that requires the use of a standard progress bar. 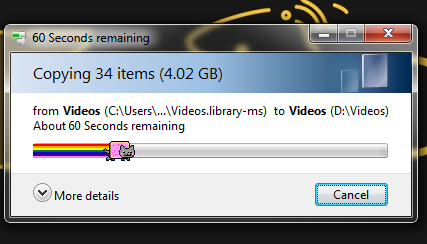 In my case, I copied a 4 GB folder full of video files, which gave me a solid minute of Nyan goodness. Nyan Cat Progress Bar includes a surprisingly useful amount of settings which you can access by right clicking the kitty icon in your system tray. Nyan Cat plays music by default, but you can set it to automatically mute if you’re playing music in iTunes or Winamp. In the settings window, you’ll also see a timer of how long Nyan Cat has danced across your screen, and you can disable the custom progress bars in specific applications in the Ignore List tab. Nyan Cat Progress Bar isn’t perfect – it works by literally covering up the standard progress bar with our feline friend. If you drag a progress bar around your screen quickly, you’ll notice that Nyan Cat has a hard time keeping up. But hey, this is the price you pay to be unique! If you like Nyan Cat Progress Bar, check out the developer’s other application Instant Elevator Music. It’s the same idea as Nyan Cat Progress Bar, but instead plays relaxing elevator music whenever you’re waiting on Windows to finish its business. 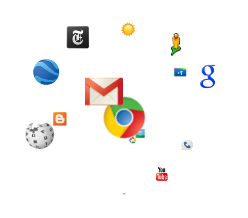 Chrome web browser: Like many of you, I’ve been having a great time playing around with Google+ for the last week. Because it’s so new – let’s not forget that it’s still in a beta field trial – engineers at Google have been tweaking and changing things like crazy in response to user feedback. This isn’t anything new of course, Twitter’s ubiquitous @reply and #hashtag features were actually created by users, and they became so popular that the company built them right into the platform. Replies and more for Google+ is an extension for Google Chrome that adds several great features to Google’s new social network. I’m sure some of these things are already in the works at Google+, but why wait when you can have them now? Google+ took the @reply feature from Twitter outright, which makes it easy to mention specific people by just appending a plus sign (+) before a person’s name (i.e. 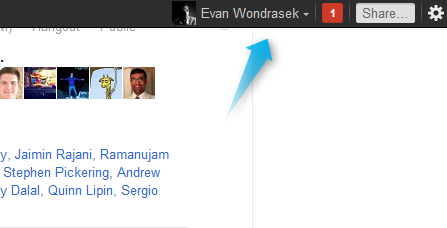 +Evan Wondrasek would mention me in a post, and I would receive a notification about it). Replies and more for Google+ adds handy links to posts and comments, and lets you reply to anyone in your stream with a simple click. Quick access to Replies will increase the likelihood of mentioning other users in posts and will definitely spur conversation. Before you go out and start +replying to every person on Google+, though: The +reply feature isn’t meant to reply to the original post’s author necessarily (although it doesn’t hurt, they’ll get a notification either way). What it is useful for is replying to a specific user in a multi-person comment thread. Evan Wondrasek: I just posted a message on Google+. Sam Rothstein: No, I don’t think you did. Nicky Santoro: +Sam Rothstein Actually, I’m pretty sure he did. But what would I know? I’ve gotten in the habit of pressing Shift+Enter to post a comment online (I think I can thank Facebook for that). Replies and more for Google+ adds this convenient keyboard shortcut as well as Ctrl+Enter so you’ll never have to take your hands off the keyboard when posting a message. I keep a few important tabs pinned to the top of my tab bar, so it’s nice to be able to glance at tab’s icon to see if I have any new messages. 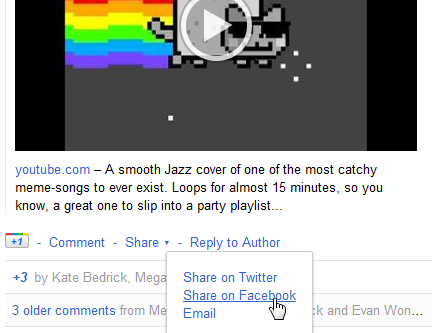 Gmail already offers this feature, and Replies and more for Google+ adds it to Google+ as well. I would say that the message count icon could be a little larger, but hey, it’s better than nothing. This is a wonderful feature, and I won’t shroud it with unnecessary verbiage; when you scroll down the Google+ stream, the black navigation bar will follow you down the page. Ahh, features. Let’s be real: Most of us aren’t leaving Facebook or Twitter. But, also being realistic, there’s a lot of great new content on Google+ and many of these things are just begging to be shared with your other social networks. Replies and more for Google+ adds a dropdown menu to the Share button on Google+, which reveals simple options to share a post with Twitter, Facebook, and good ol’ email. Go ahead, try to resist Smooth Jazz Nyan Cat. 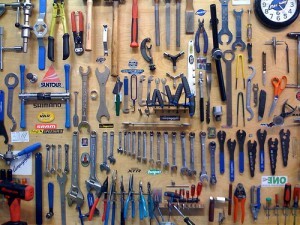 Know of any other extensions, add-ons, or scripts to enhance Google+? Share them in the comments below! This message also contains a link to “Fix This”, but you will notice that Google only provides a few vague sentences explaining that you need to disable Firebug for Gmail, and if that doesn’t work you should disable Firebug altogether. That isn’t very helpful, so in this article I’ll explain the procedure with more detail. First off, I don’t know exactly why Firebug and Gmail aren’t getting along. I’ve been running Firebug for years and have never noticed excessive slowness with Gmail, but apparently others have not been so fortunate. The easiest way to disable Firebug for a specific site is to browse to the site causing problems and press Shift + F12. This hotkey automatically disables Firebug for the current website you are browsing. Alternatively, you can open the Firebug development panel by clicking the small bug icon in the Firefox status bar (if your status bar is hidden, you can also press the F12 key to open Firebug). In the top left corner of the Firebug panel, click the orange bug icon and select “Deactivate Firebug for This Site”. Firebug will continue to operate on other websites, but when you browse to sites you explicitly disabled, the Firebug logo will turn grey to indicate it is no longer working. If you continue having problems after deactivating Firebug for Gmail, you may be required to disable the add-on entirely. 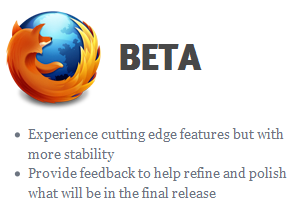 To do this, open Firefox add-ons by pressing CTRL + SHIFT + A, locate Firebug, click Disable, and restart your browser. It’s time once again for another edition of Android App Roundup! After a bit of an absence, we’re back and ready to bring you the must-have applications for your Android device. This time around we’ll be telling you about ZDBox, a handy little application that collects a bunch of tools into one place for your convenience, and take a look at Carrr Matey, an app that helps you remember where you parked your ship… we mean, car. If you know of an application that would make a good addition to a future App Roundup, feel free to send us an e-mail or let Evan or me, Kevin, know via Twitter. If you’ve had an Android phone for a while, you have probably accumulated a nice collection of useful tools to accomplish various tasks. Wouldn’t it be nice to get rid of all of those applications and replace them with a single application that can accomplish multiple tasks? Enter ZDBox. ZDBox can monitor battery life, monitor data usage, set up “do not disturb” times where your phone automatically silences, lock specific applications so they require a password to open, kill running tasks (not recommended), batch uninstall applications, and batch move applications to the SD Card. All from one easy interface. Using ZDBox is pretty self-explanatory. From the main interface, click one of the options to be taken to a sub-interface to set up or run whichever service you want to use. If you don’t want to use all of the services and don’t want the unused one sitting in the background sucking up resources, they’re easy enough to disable completely. I’ve personally been able to get rid of four single purpose applications and replace them with just ZDBox. 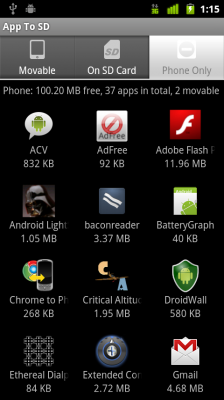 It makes an excellent addition to any Android user’s arsenal of utility applications. Let me start by telling you that I have a terrible sense of direction. And it’s not just a bad sense of direction, I also get disoriented very easily. Exacerbated by living in a metropolitan area with 3.5+ million people, I quickly sought refuge from my navigational disability in the Android Market. I then discovered Carrr Matey. With three r’s and a cheerful pirate theme, this app lets you “drop anchor” when you park your car, making it easy to find on your return trip. Using your phone’s built-in GPS, you can navigate back to your vehicle with an overhead map view or a handy compass view. 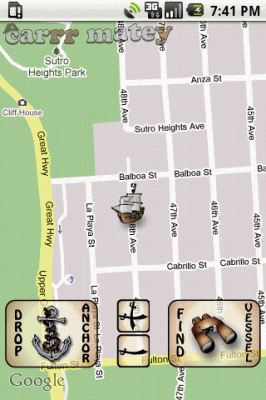 Carrr Matey's map view. The ship marks your car's location. Carrr Matey has a few extra features that make it especially useful to post-16th-century transportation. After setting the location of your parked vehicle, you can enable an optional parking timer to help you avoid expensive parking tickets. If you happen to leave your vehicle in a parking ramp, Carrr Matey’s “Harbor Mode” lets you store details like level, letter, color, or number of the parking spot. Parking timers in Carrr Matey. Sure, your friends might poke fun at you when you tell them you legitimately have no idea where you left your car. 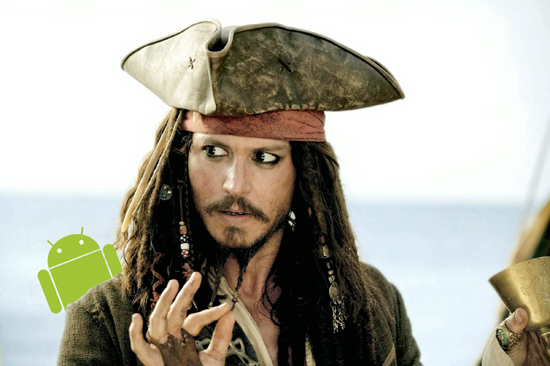 But don your captain’s hat, young sailor, because you’ve set a course with Android! My inbox is a sanctuary, a veritable digital zen garden. I have 0 unread messages, I’ve never declared email bankruptcy, and I do a fairly good job of replying to any email that needs my input. A series of small yellow stars decorate my inbox, denoting any messages that still require my action. I’ve never really talked about my email practices with others before, so I was surprised when I found that others don’t always keep their inboxes as meticulously groomed as I do. Met with incredulity, I decided to take a look at the organizational mantras I had developed over many years of digital correspondence and see what methodologies allow me to maintain such an austere working environment. I don’t receive a phenomenal amount of email – I’m sure that many of you deal with double or triple the messages I see – but between three email accounts (all managed through a single Gmail account, one of my favorite things about Google’s email service), I acquire anywhere between 30-100 legitimate, these-need-to-be-read messages per day. I greatly benefit from Gmail’s excellent spam detection, so nearly every message that reaches my inbox is something I was truly intended to receive. The following guidelines have worked well for me, and have become increasingly important as my digital life continues to grow. A cluttered inbox is the sign of a cluttered mind, and I’m confident that by applying some basic organizational principles to your email can have a positive impact on your overall productivity. My first recommendation is one of the basic foundations of dealing with any type of procrastination: take care of the nastiest jobs first, and get them done right away. Be a Now person. When you get an email that requires a response, even if it’s something you truly don’t want to deal with, attack it directly. You’ll have to do it eventually, and it will only get more unpleasant as it slowly descends through the abyss. If you can’t deal with an important message right away, give it a star and come back to it as soon as you have some free time (more on this in Star emails, but make a clear distinction between “To Dos” and “Reference” emails below). If you ever find yourself descending into the “procrastination death spiral”, a term I lovingly coined for when you’ve put something off for so long you now feel too guilty to do it anymore, grit your teeth, apologize for the delay, and reply just as you would’ve in the first place. This principle has an important caveat: you don’t want to be constantly dealing with emails all day and night. Real, genuine recreational time is incredibly important to your physical and mental well-being, so establish some ground rules for dealing with email. At work, maybe you can set aside 5 minutes out of every 30 where you focus exclusively on your inbox. At home, you could have two well-defined email sessions in an evening, and anything past 10pm can wait until morning. Being a Now person will make you feel better, your “to do” list will shrink, and people will love that you’re the guy who responded to them promptly and will likely return the favor. Cue beams of golden sunlight, angels with heraldic trumpets, and rainbows shooting out of your well-maintained inbox. Gmail’s Priority Inbox feature is one of the single best tools in your organizational arsenal. This supercharged version of your standard inbox can automatically identify which emails require more attention than others, and through your careful instruction, it can learn to make better decisions over time. To enable Priority Inbox, go to your mail settings, click the Priority Inbox tab, then select Show Priority Inbox at the bottom. While the automatic prioritization of emails might be useful for many of you, a secondary feature of Priority Inbox is what cements its usefulness for me: the ability to view starred messages in your main inbox, just below your priority messages. Starred messages are the focal points of my “getting things done” mentality, so looking at their yellow, five-pointed selves every time I open my inbox is the single best way to guarantee they’ll get dealt with. Although I don’t recommend using your email inbox as your primary “to do” list (there are several other services that offer superior task management features and can integrate directly into your email), starring important messages is an excellent way to keep track of messages that require action on your part. As mentioned in the Deal with important or unpleasant messages immediately principle, there will be times when you simply can’t reply to a message right away, or perhaps you need to take care of a few things before finishing the task. Messages like this should receive a star, and by using Priority Inbox you’ll see that message front-and-center each time you log into Gmail. When using stars, it is very important to differentiate between “To Do” emails and “Reference” emails; failing to do so can cause you to be overwhelmed with starred messages that never seem to be resolved. 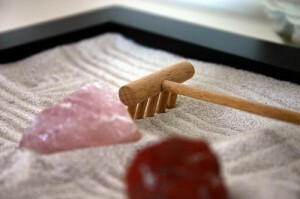 Only star messages that have a clear task, objective, or require an action on your part. Here’s a good rule of thumb: if the task will be resolved by an action, it’s ok to star. 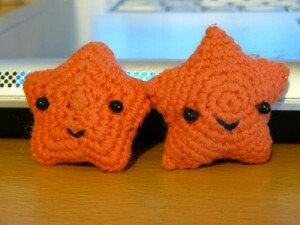 If the task will be resolved on its own after a period of time, it should not be starred. Rather than putting stars on reference emails, create a label in Gmail for them instead (these are essentially folders for those of you that are familiar with desktop email clients). Because Gmail now allows you to nest labels (create subfolders), you can easily divide up reference emails into multiple categories. I have three: Personal (schedules, important contact information, lists), Professional (work-related reference email), and Techerator (schedules, project plans, staffing information). If you’re really interested in taking your inbox organization to the next level, you can use Gmail’s superstars to visually distinguish between different types of important emails. This can help you prioritize tasks (for example: red stars for urgent priority, blue stars for low priority), but be careful not to go overboard with them. Adding a different star for every message could easy have an adverse affect on your organizational system, so use them with moderation. For sure, the American people have access to more information now than any other people who have ever lived on earth. And I think we do a pretty good job of sorting out what’s important. I grew up admiring this type of organization used on the farm. A lot of people maintain the illusion of a clean inbox by heavily filtering their messages. Filters allow you to pre-process messages before you even receive a new mail notification, but you should never create a filter that hides messages from your view. For example, some people will create a “catch-all” rule that filters messages of a certain type and automatically marks them as read. This isn’t safe (and you’ll forget about it over time), which can easily result in a lot of legitimate messages going to the briny depths of your inbox without your knowledge. Rather than hide messages, use Gmail’s great filtering system to automatically add labels to your email so you can quickly sort through them yourself. I’ve created sorting filters like “Social Networks” that automatically label messages from sites like Facebook, Twitter, Flickr, and YouTube. While I still see these messages in my inbox, now that they’re labeled I can quickly mark them all as read after I’ve had a chance to confirm their importance (using Priority Inbox’s priority feature is especially useful in this scenario). Staying on top of a busy inbox is not easy, especially since our inboxes now house personal correspondence, bills, social network notifications, information requests, To Dos – the list can go on for days. If you’re currently overwhelmed by email and the elusive “inbox zero” seems to constantly evade your grasp, try following some of the principles I’ve presented in this article and see if it works for you. Be a Now person. And if you don’t receive a lot of email and therefore don’t have a messy inbox – start using these tips now! They’ll be invaluable as your email intake inevitably grows. Google recently rolled out their +1 button for websites, which is their answer to Facebook’s near-ubiquitous Like button you see pretty much everywhere nowadays. By clicking the +1 button on websites you enjoy, you give them a “vote” in Google’s search engine listings. Due of the sheer popularity of Facebook and the Like button, sites like Google, Amazon, and YouTube have hustled to get on board with the trend. This level of social integration is an especially significant move for Google, since it will directly impact search listings outside of your own personal browsing history. Search is Google’s baby (and original product, let’s not forget), so it’s safe to assume they take new features pretty seriously. If you’ve enjoyed reading articles and guides at Techerator, please consider giving us a +1 by clicking the button below. It’s an easy way to show your support, and it helps us continue to grow. If you’ve ever created a Menu in WPF, you’ve probably noticed something peculiar: A Menu will not stretch to fill the entire width of its parent container. If you set the Menu’s width to ‘auto’ or delete the width property altogether, the Menu will shrink to the maximum width needed by its MenuItem elements (so if you have 0 MenuItems, it will disappear completely). A Menu in WPF only stretches to the width of its children by default. This is contrary to the default behavior of a Toolbar control, which will automatically stretch to the width of its parent container. This will stretch your menu to the full length of its parent container, which in my case is the entire window. If you prefer to do this programatically in C#, you can set the Menu’s width to equal the parent container’s width after the parent container has loaded (doing so before the parent container has loaded would set the Menu’s width to 0). And in the event, I set the Menu’s width to the ActualWidth property of its parent container, which is the same Grid I used in the earlier example. This has the same effect as binding the element properties in WPF, but we’ve overlooked one important thing: since the width of the Menu is only set when the control is loaded, it will not change if you resize the Window after the application is running. And in the SizeChanged event, once again set the width of the Menu to the width of its parent container as we did before. This will give you the same functionality as the WPF solution, although it requires some additional code.